I started to configure vim so I installed pathogen and solarized. 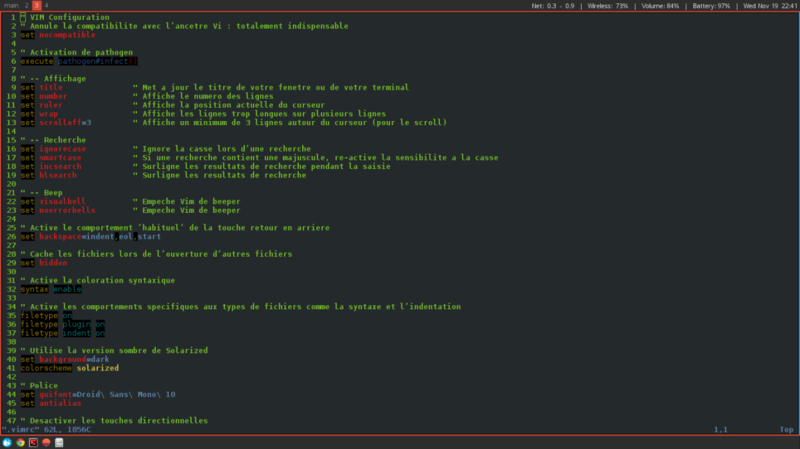 Here is my .vimrc and the screenshot of the solarized theme at the same time. I don't understand why I have keywords like 'set' highlighted in black? Is it because of terminator? EDIT The real problem is that you can set different background/colors in vim, in zsh and also in terminator config. Is there a way to make it all looks like solarized? I think the problem comes from backgrounds that overlap each others. The black color is actually the background of terminator. Colorscheme authors can build their own palette from a 16,777,216 colors palette for GUI colorschemes, the 256 colors xterm palette for 256-colors terminal emulators and the 16, user-configurable, named ANSI colors in other cases. The obvious consequence is that it is extremely difficult to come up with a colorscheme that is guaranteed to look the same everywhere. The choice I've made with my colorscheme was to only use colors from the xterm palette in the GUI version, making it virtually impossible to distinguish between terminal Vim and graphical Vim based on the colors alone. I honestly don't know how many colorschemes do that but the intrinsic limitations of that palette (no browns, for example) admittedly make that a bit complicated and restrictive. For 8/16 colors terminals, I provide the values of 18 from my palette so that the user can customize his 16 ANSI colors and enjoy almost the same experience as with more capable terminals or GVim. This is something that every colorscheme author has to do and there's no workaround. Some colorscheme authors start their work with a limited and arbitrary palette, often 16-20 colors, that they retrofit into their colorschemes. Since their palette is most of the time outside of the xterm palette, they are able to give you a pretty impressive out-of-the-box GUI experience but the 256-colors terminal experience is usually so-so, forcing you to retrograde your terminal to a xterm $TERM to enjoy the customized ANSI colors. Not the answer you're looking for? Browse other questions tagged vim themes syntax-highlighting terminator or ask your own question.